COLUMBUS, Ohio, December 2, 1997. A funeral will be held Thursday for George Wright Ferguson of Worthington, whose book on traveling by rail earned him the nickname ``Mr. Eurail'' within the travel industry. Ferguson, 77, died Sunday at a Columbus hospital. He had suffered two aortic aneurysms and strokes in 1993. He co-authored "Europe by Eurail: How to Tour Europe by Train'' with his wife, LaVerne. The book's 22nd edition was released this week. They also wrote ``Britain by BritRail,'' now in its 14th edition. The Fergusons opened Rail Pass Express in Worthington in 1986. Today, it's the largest rail pass outlet in the United States. Mr. Ferguson took his first European train ride during World War II on a freight car called a "40-and-8'' because it could carry 40 soldiers and eight horses. He was a test pilot and engineering officer during the war. He later was assigned to military duty in Korea, Japan and Vietnam and at the Pentagon. 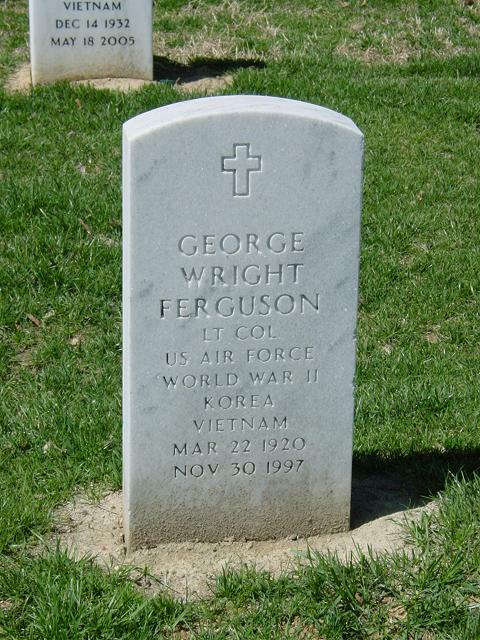 Mr. Ferguson left military service to work at Battelle Memorial Institute in Columbus, where he was international coordinator for several laboratories. In addition to his wife, Ferguson is survived by a son, Sandy, and stepson, Matthew Palma. Burial is scheduled for December 9, 1997 in Arlington National Cemetery.